To celebrate the bicentenary of the publication of Mansfield Park each month I’ve been trying to read something inspired by Mansfield Park. 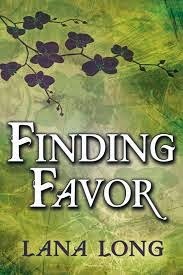 ‘Finding Favor’ by Lana Long is a young adult modernisation of the book. 17 year old orphan Favor Miller has lived with the Brown family for the last 8 years. Mr Brown was a college friend of Favor’s father. Favor doesn’t remember much of her family, so her most highly-prized possessions are journals belonging to her father and grandfather which she reads in times of distress to feel close to them. Although Favor lives with the Browns she isn’t really part of the family on an emotional level. When Mrs Brown spends time with her daughter, Madison, Favor is not invited to join them. There are two Brown sons, Tom, the party-boy elder son, and younger son Ethan, the Edmund character, who is Favor’s closest friend. Favor adores Ethan and secretly hopes for a romantic relationship between them one day. As it nears Favor’s eighteenth birthday she is summoned to Mr Brown’s office, He wants her to sign a contract. It’s not really legally enforceable but more of a moral agreement. He will provide her with college tuition and arrange an internship which will greatly assist Favor in her desired career of horticulture. In return, she will comport herself in such a way that doesn’t embarrass the Brown family and she will also back off from her relationship with Ethan so he has a chance to forge new relationships that will be of benefit when he goes to work for his father’s company. Favor is devastated by this. Firstly, it shows how little the Browns have accepted her into their family, after all this time. She knows that Mr Brown has contacts that could seriously affect her future career prospects too, but the thing that really upsets Favor is the thought of having to give up Ethan. To cope with the day to day slights of being only tolerated rather than loved and the bullying she receives from Madison, Favor has purposely withdrawn – she has very few friends aside from Ethan, so he has become her whole world. 'My parents died and I'd accepted it. I lived a quasi-life, trapped by the Brown rules and expectations, and I'd accepted that. If I accepted those things so easily why was I struggling to accept that I'd never be with Ethan? One of the Brown’s neighbours has some visitors coming to stay – brother and sister Henry and Mary Crawford. In no time at all Ethan is under Mary’s thumb, and Favor faces having to lose him whether she signs the contract or not. Mr and Mrs Brown, like Sir Thomas and Lady Bertram in Mansfield Park, are not hands-on parents. He works almost constantly, and is a controlling authority figure rather than a loving dad, and Mrs Brown is often mentally absent even if she’s usually physically there. She is often staring at her smartphone rather than engaging with her children. Favor is not treated the same as the Brown children, she is staying with them long-term rather than being a member of the family. I had mixed feelings on this book, as there were things about it that I thought were really good and other things I wasn’t sure about. I thought there were a number of aspects that would have been better if they’d been portrayed with a bit more subtlety, especially Madison. Madison is like the characters of Maria Bertram and Mrs Norris rolled into one so as you can imagine she is really horrible. However, Maria Bertram kept her horribleness under a veneer of propriety, so it was only because her parents didn’t know her well enough that meant she could get away from it. Here Madison is not just spoiled, childish, manipulative and conniving, but she throws tantrums, and the whole family is aware of her behaviour. It was so extreme it was almost bordering on mental illness. There were a few scenes featuring Madison which I found pretty unrealistic because I felt they were over the top. "Let's start locally, and go globally if needed." However, Tom’s care for Favor only makes Ethan appear worse. The event mirroring the part in Mansfield Park when Edmund overlooks Fanny’s need to use her horse is far less forgivable in this book. I didn’t feel that Ethan had many redeeming features, he drops Favor like a hot cake when Mary Crawford arrives on the scene and he is generally selfish all the way through the book. I thought this was a shame, because although some people don’t have time for Edmund in Mansfield Park, I personally think that he was a responsible and thoughtful man, who genuinely cared for Fanny, and the fact that he cared for Mary Crawford before realising how he felt for Fanny Price is no more reprehensible than Elizabeth Bennet initially being attracted by Wickham in Pride & Prejudice. Mary Crawford in Mansfield Park is a character that leaves me torn, because secretly I really like her, despite her faults. Mary is a very interesting character, but here she was more two-dimensional – this Mary is shallow, uncaring and a bragger. And that is really all there is to her. I didn’t really understand Favor’s sudden determination to stake her place in the Brown household. If she’d been content to live for so many years on the periphery and taking a ‘you and me against the world’ attitude with Ethan you think that aside from him Favor would be keen to leave the rest of them behind. It didn’t feel likely that she would be so fiercely attached to them. On the whole I enjoyed this author’s style. There was a lot of humour, which I enjoy. The book is written in the first person, from Favor’s point of view, but sometimes it didn’t seem to quite work – some of the descriptors used seemed awkward outside the third person, such as Favor describing her own eyes as liquid, etc. I liked that the author had taken the time to work out how the upbringing had affected each child, as it was different in each case. I thought it was an ambitious attempt at a young adult version of a complex book and it wasn’t bad at all. I’ve read a few YA versions of Mansfield Park now, and my favourite is still the first one I read, Rosie Rushton’s ‘Whatever Love Is’, but this one is enjoyable too, and I'd give it 3½ stars. Nice review! I'm glad it was humorous, makes it a bit easier to read! Madison does sound horrible! Lol! I haven't heard of this book. It was enjoyable to read, but i found it frustrating too, because I felt there were parts that could have been better. I don't know where I first heard of it, but I think I added to my wishlist from a list of things inspired by Jane Austen and then when it went free I downloaded it. I rediscovered it when I was looking for Mansfield Park reads on Austenesque Reviews, was very pleased to see I already had it! Excellent review, Ceri! This sounds like an interesting modern spin on Mansfield Park…my least favorite Austen novel. ;) Adding this to my TBR list. Thanks! Thanks Jakki! I don't think you're alone in having Mansfield Park as your least favourite, judging by how books there are based on it. I was quite surprised how thin on the ground they were when I started my MP reading challenge.